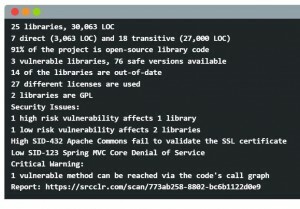 DevOps firm SourceClear wants to give DevOps engineers (now that we all agree that this is a real job title) more tools to help find vulnerabilities in open-source code. The firm’s eponymously named SourceClear Open is intended to help detect emerging security threats above and beyond the level of known threats that have been classified in databases held by both public malware detection vendors and government databases. SourceClear Open is based on a foundation drawn out of SourceClear’s commercial products – it is delivered as a cloud-based service. CEO of SourceClear Mark Curphey says that his team designed the product as delivered because developers always want to do the right thing, but have been faced with tools that generate more noise than signal. Curphey claims that the technology can track thousands of threat sources and analyse millions of open-source library releases. SourceClear includes ‘Registry’ a free database of security knowledge in the world’s open-source libraries and frameworks, including a complete list of all publicly disclosed vulnerabilities. In addition to the Open edition, both Pro (additional premium features and support) and Enterprise (extended features for complex requirements) editions are available.